The product line Citterio has been in existence since 2003 and has been continuously developed ever since. 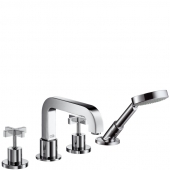 The distinctive faucets have corners and edges and are equipped with remarkable cross handles or lever handles. The cross handles are based on the architecture of the 1930s in Italy. 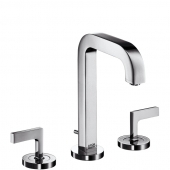 Despite their striking appearance, the faucets leave a slender and elegant impression. 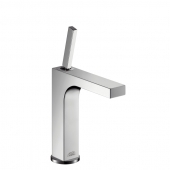 The product line was designed by the Italian architect Antonio Citterio, who has been working with Axor since 2001. 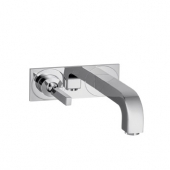 The basin taps from Citterio series are available both in manual and electronic versions and offer a wide range of individual forms and sizes. The selection includes single-lever stationary mixers with the following heights (each measured with a lever): 200 mm, 228 mm, 263 mm. The projection is between 104 mm and 201 mm. 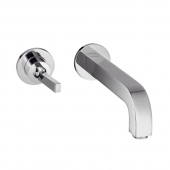 The personal choice of the handle: cross handle, joystick handle or lever handle offers further options for individualization in the bathroom. There are also two design options for the form: rectangular basic shape or slightly horseshoe-shaped with the spout rounded downwards. 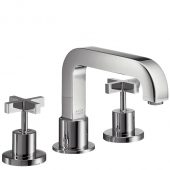 The large selection of stand faucets also includes three-hole variants with or without rosette and optional cross or lever handles. 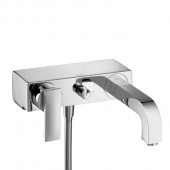 The series also offers single-lever washbasin mixers with or without rosette and in different projections for wall mounting. 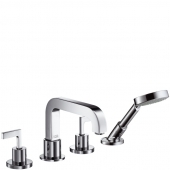 The range also includes a three-hole faucet with a cross handle or lever handle and available in different projections. 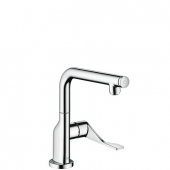 The electronic faucets are operated via a 230 V line connection and have a projection of 160 mm or 220 mm. 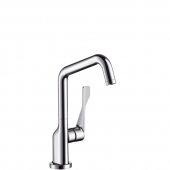 The spout stretches straight away from the wall and then bends downwards. This is where the combination of angular and round shapes stands out, with soft radiant and precise edges. 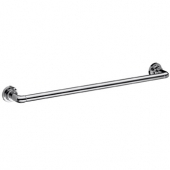 For the shower, Citterio series offers various Showerpipes consisting of a single-lever mixer, a head shower, a hand shower, a shower head holder and a shower rail. The angle of the showerhead can be adjusted to suit personal preferences. The jet type is the relaxing rain jet, which is perfect for washing out foam from the hair. 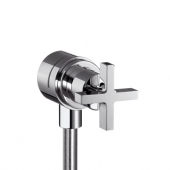 If you are not contented with one jet, Citterio also offers a Showerpipe with three types of jet in the head shower: normal jet, massage jet and soft jet. The spray modes can be changed at the head shower. 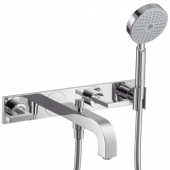 Shower head and shower set are also available separately and can be combined with individual mixers or thermostats. 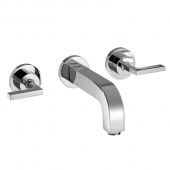 These go well together with cross handle or lever handle. 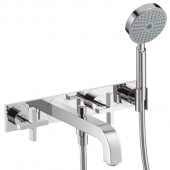 If you want a larger shower head, you can combine the faucets of Citterio with the Axor ShowerSolutions head showers. 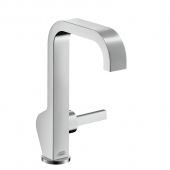 An additional function is provided by the angular shape of the single-lever shower mixer for surface mounting: the tap also offers a practical shelf. 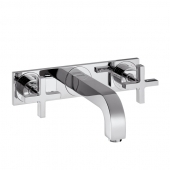 Choose between different versions of bath mixer in Citterio series: for wall mounting: single-lever surface-mounted bath mixer, in-wall three-hole bath mixer with or without rosette or a single inlet in combination with a single-lever mixer. 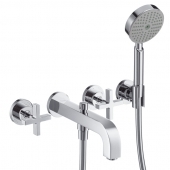 For bath rim mounted installation: four-hole bath rim mixer with inlet and shower or a three-hole bath rim mixer without shower head. 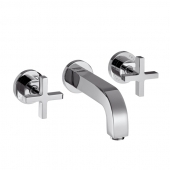 Usually the variants are available with either the cross handles or the lever handles and the projections can also vary in size. 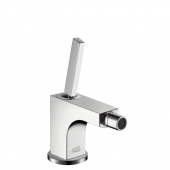 If you are looking for something special, you will be delighted with this free-standing faucet. 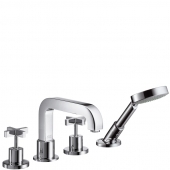 This fits well with free-standing bathtubs that consists of a foot with bath inlet and shower head holder, a hand shower with two types of jet and a shower hose. 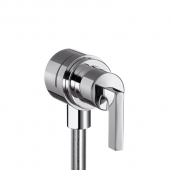 The Citterio series also includes two bidet faucets: one variant has a rectangular base from which a cylindrical outlet projects and to which the spherical joint jet former is then attached. With the other variant, the base body bends at right angles and the jet former is then attached to it. Both are equipped with the joystick handle and have a normal stream. The bidet faucets stand on a flat round plate as a support surface. The kitchen faucets impress with their extravagant form. Valve bodies that vary in thickness and irregularly curved outlets form the image. 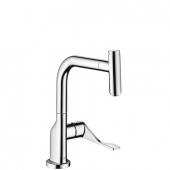 Some faucets offer a practical Select-Button for easy on and off water, others have an extendable spout. 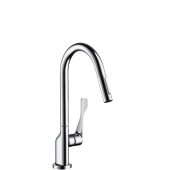 For flexible working in the kitchen, all faucets can be rotated in three stages (110°, 150° and 360°). 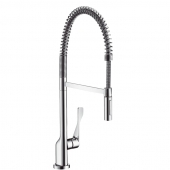 The Semi-Pro kitchen mixer also has an adjustable spray jet that can be adjusted at the push of a button. 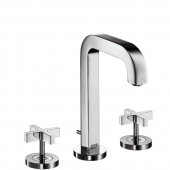 Citterio series also offers accessories with distinctive designs. The lines are expressive and particularly elegant. 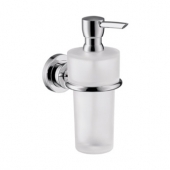 Citterio offers, among other things, soap dispensers, towel rails and toothbrush cups that perfectly match the faucets.